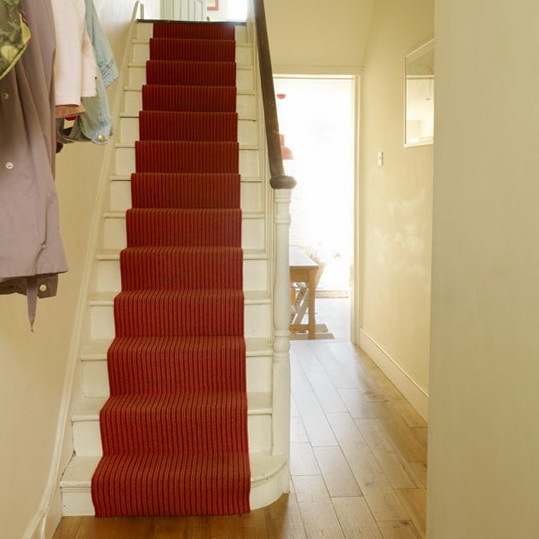 Create a warm first impression in your hallway with a cheerful red wool stair runner on painted white stairs. 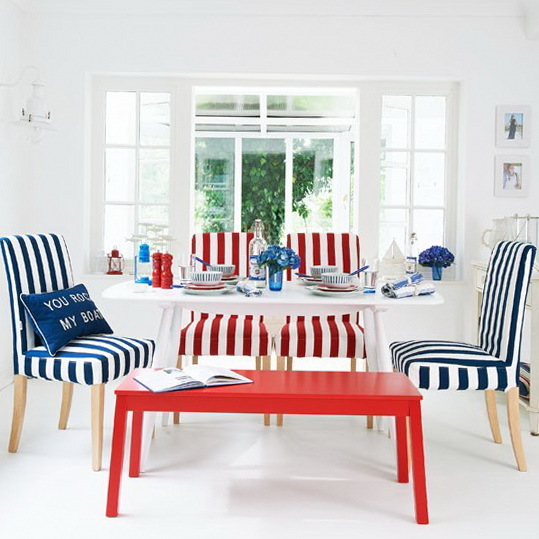 Go for a tonal red stripe rather than a multi-coloured design to make a sophisticated style statement. Buy a sleek console table to give you a space to put the mail, door keys and other day-to-day essentials, while a drawer will keep emergency window cleaner money and takeaway menus hidden from sight. 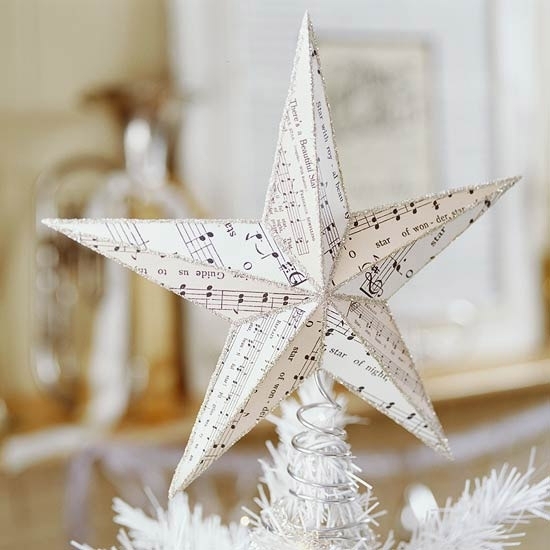 Choose a leggy design to keep the floor space as clear as possible, especially if your hallway is small. 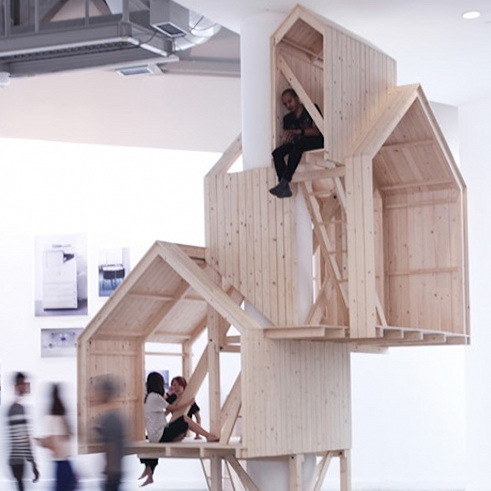 Don’t be tempted to box in under your stairs — if you choose clever furniture, you can hide the clutter and benefit from the sense of space an open-plan hallway will offer. 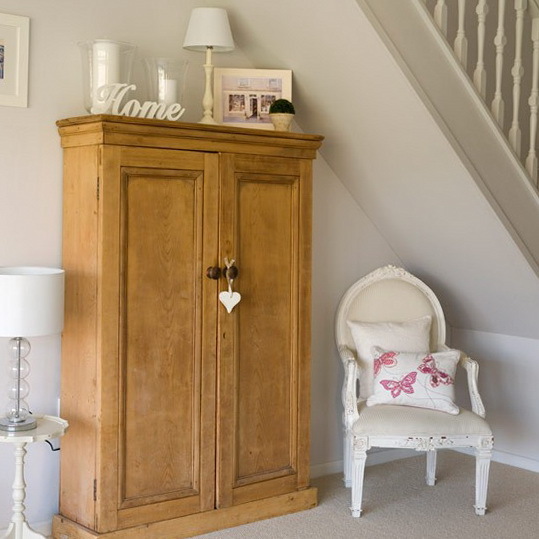 Choose a slim shoe cupboard, add few pretty touches and you’ll get a modern country look. For a no-paint option, fix narrow shelves to the walls in your hallway to provide extra storage for books. 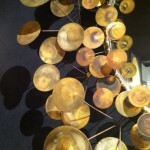 Go for adjustable ones to make the most of available space. 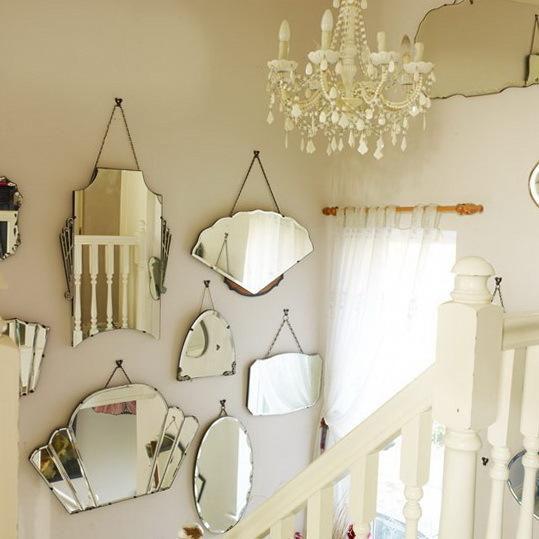 Trawl boot fairs and charity shops looking for shapely mirrors, ready to hang as a group for a vintage-style hallway display. 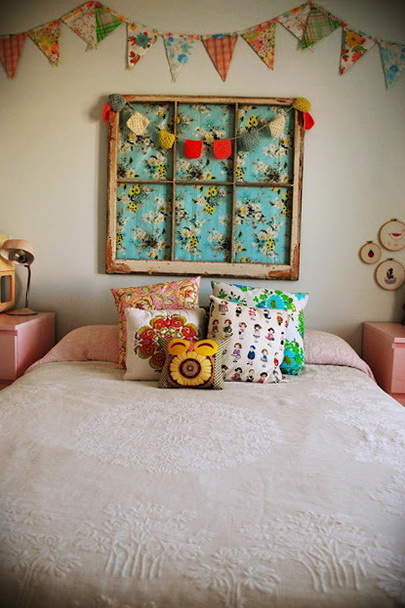 Look out for a junk shop or flea market find to house shoes, hats, gloves, scarves, even the kids’ PE kit in your hallway. 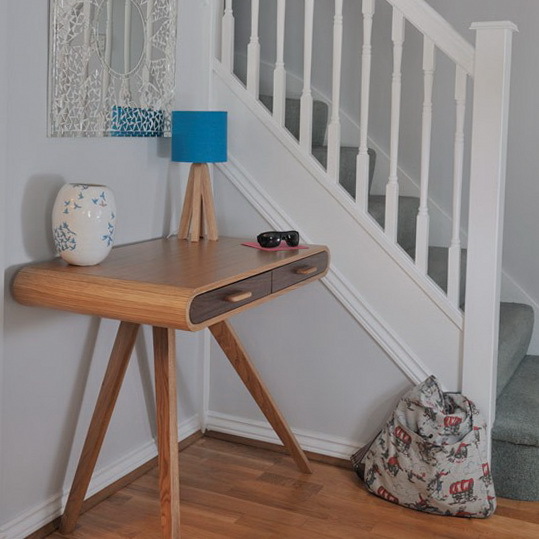 Measure first, so you can find a cupboard that tucks in under the slope of your staircase for maxiumum hall storage. Make the most of a narrow wall in your hallway by hanging a mirror — it not only reflects light, it’s just the thing to check your appearance before leaving the house. 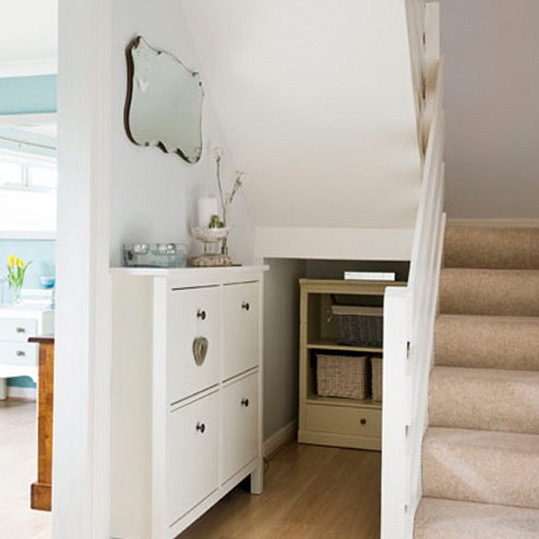 Paint your walls a chic grey paint colour for a modern hallway. 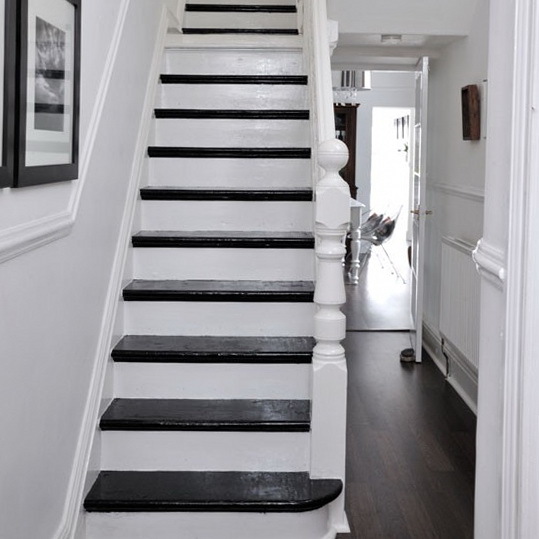 If your stairs are painted, choose a contrasting colour for the treads to make them into a feature. 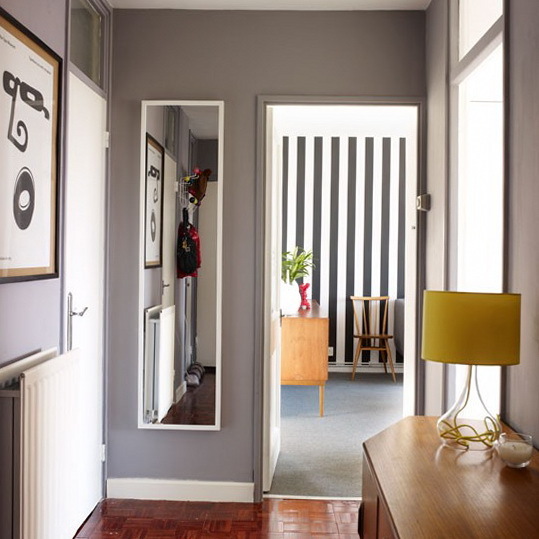 Here a black and white hallway colour scheme makes a stylish modern hallway. 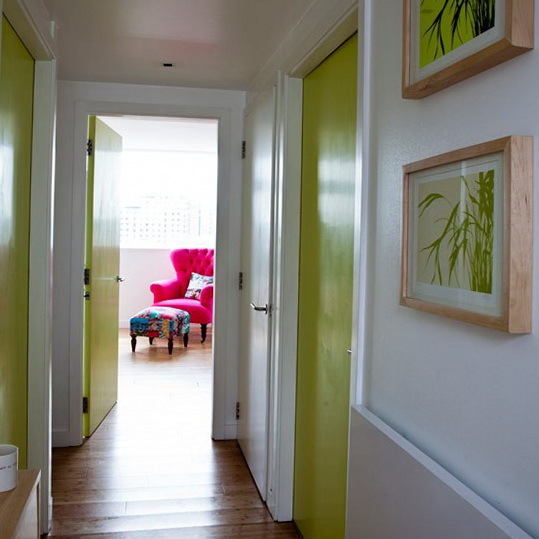 Paint the doors leading from your hallway a bright colour to add interest, especially if your hall is more of a corridor than room. Choose a zesty green paint for a fresh look, that works brilliantly with wooden flooring. 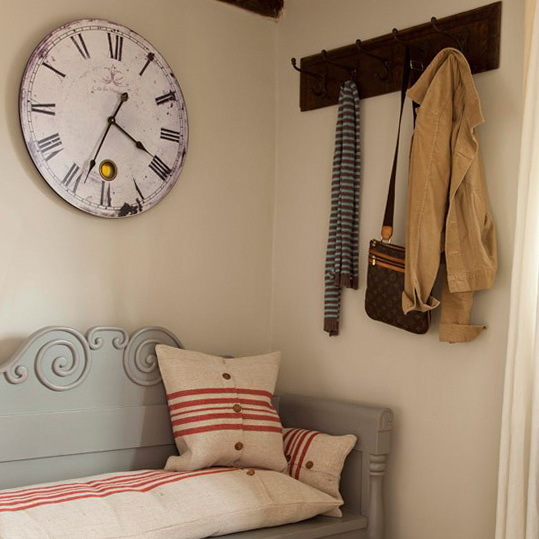 Give a plain wall a focal point with an oversized wall clock. 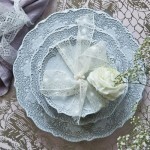 Choose one without a heavy frame or glass front for a country look in your hallway.